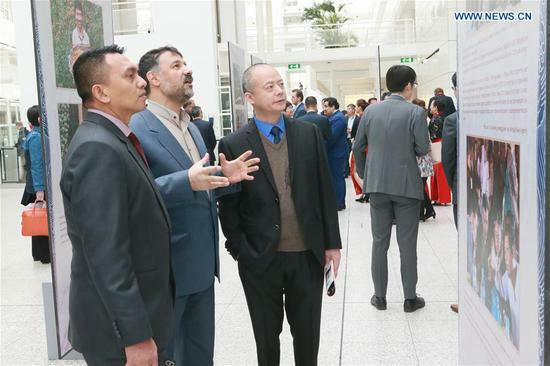 THE HAGUE, April 11 (Xinhua) -- The exhibition "Better Life, Dream Come True -- Poverty Alleviation in China" opened Thursday in the Atrium of the City Hall in The Hague. "There is a saying that the goal of the Chinese is to create a better life and they like to do it quietly without drawing much attention to themselves," said Mayor of The Hague Pauline Krikke at the opening ceremony. "This exhibition however put the results China has achieved in combating poverty firmly in spotlight. And rightly so. Because the results are indeed very impressive, something to be very proud of." Through photos and texts, the exhibition tells the story of China's poverty relief efforts. "It is remarkable to see how China is working on reducing of poverty in that immense country that China is. Tremendous progress has been achieved in just a very short period of time," said the mayor. Peter Potman, Director of the Asia-Pacific Department at the Netherlands Ministry of Foreign Affairs, noted that "China has reached the Millennium Development Goal target of reducing extreme poverty rates by half -- contributing to poverty reduction globally, and setting an example for developing countries worldwide". Among visitors was a teacher from German International School in The Hague who guided his Chinese-learning teenager students during the exhibition. "I enjoyed it," one of the students, Bianco Marcu, a 14-year-old Romanian girl told Xinhua, "it is a great experience to see what the Chinese have done and what their stance is over the issues of combating poverty and sustainability." "Fight poverty is an important issue of sustainability. If you want to make a better life for our future, it is good to take students to have a look at this exhibition," explained Markus Rudolph, the German teacher who speaks fluently Chinese. Sponsored by the State Council Information Office (SCIO) and Jilin, a province in northern China, the exhibition was held at the headquarters of European parliament earlier this week.